Enter to win an eBook copy from Mary Eason. Just comment on this post. Include the first part of your email address that you used to sign-up for the Night Owl Reviews newsletter / Fan Club. You must be a member to enter. Ends 8/13/2010. Recently, while traveling back from Colorado, my husband and I had a near catastrophe happen in our motor home. We had just crossed over the state line into Texas when we blew out a steer tire on the driver’s side. Now, I don’t know if anyone else has experienced this before, but to say it was scary is the understatement of the year. Thankfully, my husband, who owns a trucking company and has driven big trucks for most of his life, knew exactly what to do. We were able to avoid hitting anyone while making it safely over to the shoulder of the road. But as a writer, well, naturally that got my creative juices flowing, (at least after I recovered from the fright). I started thinking about other near misses and how most of the major events in life happen in the blink of an eye, both good and bad. For instance, I fell in love with my husband in a blink of an eye. Yeah, I know, corny, but true. I read my first romance novel, was hooked, and knew (in a blink of an eye) that this was what I wanted to do with my over-active imagination that kept getting me in trouble, (thank goodness). But for all the good moments that happen instantly, there are some bad ones that stand out as well. My dad passed away in the blink of an eye the summer before I turned twenty-one. I still miss him even after all these years. And, in a moment in time, the world changed forever, (at least for us Americans), after September 11, 2001. I will never forget where I was at that time when the first plane hit the World Trade Center and life, as we knew it, was gone in a vapor. Well, that’s kind of the premise of my upcoming Inspirational romance, entitled, Standing On The Edge Of Goodbye, available August 13 in e-book format through White Rose Publishing. In a blink of an eye, Matt’s Stevens life is changed forever when his wife and son are killed in a car accident. For Matt, life as he knew it, being a proud father and happy man all ended that day. For Kate Alexander, learning that she is pregnant by the man who almost ended her life is hard to accept. 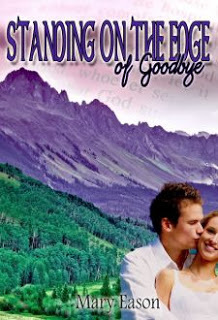 Hearing that her Grandmother, her sole support system, has passed away, well it’s almost too much for Kate to deal with, until in a blink of an eye, God brings these two damaged souls together and an unlikely friendship leads to the love that neither of them expected to happened again. So, you just never know what’s going to happen next…in the blink of an eye. Matt Stevens is finished with life. Grieving the death of his son, Matt withdraws from humanity, sequestering himself in a mountain cabin far from the reaches of anything human, anything that may remind him of the life he can no longer have. That is, until Kate Alexander arrives on his doorstep and begins to strip away the bitterness he carries in his heart. there be more to this unlikely friend of her grandmother's, —something beyond the cold surface he presents to the world?